On Friday, September 7, Secret Cinema returns to Eastern State Penitentiary for a screening of the little-seen 1937 feature We Who Are About to Die. The Secret Cinema is proud to return to Eastern State Penitentiary for our 13th screening there on Friday, September 7. As usual, we’ll be entertaining our “captive” audience by projecting prison-themed film fare in a screening room complete with real steel bars, echoing the scenes on screen in a unique twist on “3-D” movies. 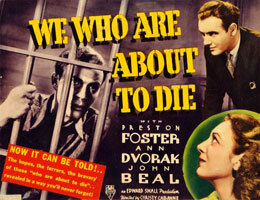 This year’s feature film will be WE WHO ARE ABOUT TO DIE, a little-seen 1937 drama based on the true story of wrongfully convicted death row inmate John Lamson. There will be one complete show, starting at 8:00 pm. Doors open at 7:00 pm, allowing the audience time to take a look at many new and existing museum exhibits at ESP. Admission is $10.00. As always at our annual film screening at ESP, seating is limited, so early arrival is suggested (there’s plenty to look at while you’re there!). All Secret Cinema presentations are projected using 16mm film (not video).on a giant screen. The program will include the following feature, plus surprise short subjects. This little seen drama stars John Beal as an innocent man who is convicted of murder and sentenced to death. He learns the grim reality of life on death row, where each condemned man waits his turn on the gallows. Nobody will believe his story, except for his faithful girlfriend (Ann Dvorak) and one hard-working police detective (rugged, Ocean City, NJ-born screen hero Preston Foster). The film was based on the true account of author David Lamson, who spent 13 months awaiting execution in San Quentin before the Supreme Court reversed his conviction. Christy Cabanne, one of the most prolific directors in screen history, began his long career as an assistant to D.W. Griffith. In 1947, near the end of his career, he directed Bela Lugosi’s sole color film, SCARED TO DEATH, a Secret Cinema favorite. Eastern State Penitentiary, built in the 1820s, is a world famous historic landmark, which influenced the design of hundreds of other prisons. Closed as a working prison since 1971, the decaying structure, which once housed Al Capone and Willie Sutton, has become a popular tourist attraction and museum over the last two decades. The film will be projected right inside the main prison building in a hallway just outside Capone’s cell, surrounded by iron bars and ghosts of convicts past.